(CNN) -- Juliana Farris Mazurkewicz arrived at her daughter's day care in Hockley, Texas, ready to pick her up, when she saw a sign that stopped her in her tracks. "You are picking up your child! GET OFF YOUR PHONE!!!!" read the sign, which was taped to a window. Those were the first two lines in the page-long missive aimed at parents who appear too busy in the online world to appreciate their children in the real one. 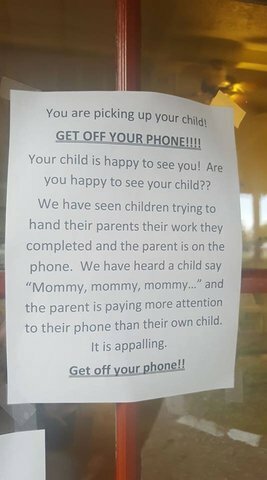 "We have seen children trying to hand their parents their work they completed and the parent is on the phone," the sign continues. "We have heard a child say 'Mommy, mommy, mommy ...' and the parent is paying more attention to their phone than their own child. It is appalling." So Mazurkewicz picked up her phone (yes, the irony) and took a picture of it. Then she put the pic on Facebook, where it's been shared a staggering 1.3 million times since she posted it on Friday. Mazurkewicz said she's not angry at the day care, which she declined to name, for putting up the sign. "I was a bit shocked, but I didn't feel any negativity towards the day care," she told CNN. "I know that the staff has the best interests of the children in mind, even to the point where they are willing to offend the parent." Mazurkewicz hadn't heard what the reaction was from the other parents, but she was curious to know what they thought. The comments and reactions to her post were decidedly mixed. One parent seemed to agree with the day care's message, saying "You can't take a minute to greet your child and ask how their day went? Sad." Another thinks day care workers should have better things to worry about than when someone is using their phone. "This is ridiculous," the commenter wrote. "Who is anyone to tell a child's parent not to use their phone? They might be working? Or have an emergency or anything else that's none of their business."